The Tattoo Coloring Book by Oliver Munden and Jo Waterhouse was the second coloring book I bought. 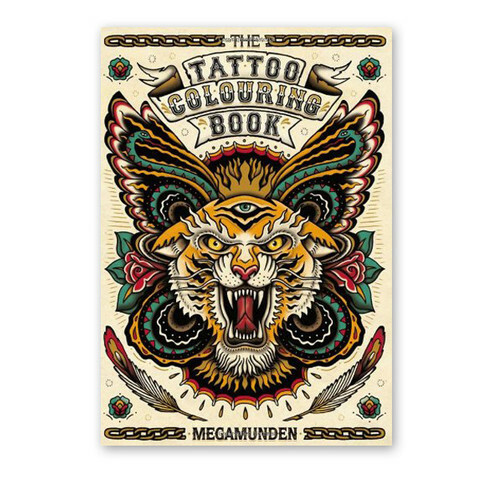 I love tattoo art, so this is probably the book I was most excited to pick up...initially. The artwork in this book is stunning and leans toward a traditional style of tattoo. Lots of animals: roaring tigers, leaping sharks, snakes wrapped around skulls and whatnot. The cover art is beautiful, and there's a pull-out section in the middle wherein the images are beautifully filled in. You could easily remove and display it if you wanted. I was probably most excited by some of the more offbeat art choices. There's a skull with octopus tentacles wrapped around. A bird with a monocle and tophat that looks oddly Sherlockian. Adult coloring books tend to be really intense in their designs. Complicated, intricate pictures that take ages to color. This book is nice because many of the images are a little more open with a bit more breathing room. Coloring one is generally not a week-long commitment. Maybe just an hour or two depending on the picture or spread. While the artwork is grand, I'm quickly discovering that not all coloring books are created equal because at the root of the thing is the paper quality. The paper in this book feels lovely and thick, but I've found that it's quick to disintegrate if you try to layer many colors together. I'm a big fan of layering and blending colors, and it's not unusual at all, in this book, for the paper to begin wearing away in spots. I've also found that the paper texture doesn't actually take color that well. A slicker paper would show truer, more vivid colors. I shared a long shot of this picture on Sunday, but here's a closer one. There's a little more color in real life--it always looks more washed out in photos--but this paper just won't take the vivid color I appreciate from other books. This was the first picture I colored from the book, and while the color is a little better in this one, it took a lot of work and quite a few worn spots. Overall the artwork in this coloring book can't be beat, but the paper quality really is an artistic buzz kill. Buy with caution. Last week I discovered that I'm not too good at coloring basically because my color selection stinks. How did I not know about layering and blending? You need to write a post on coloring techniques. 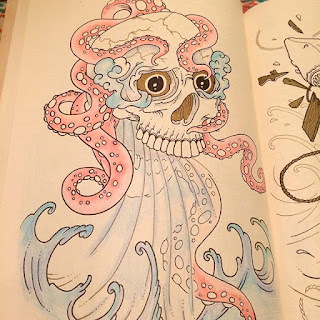 I love love LOVE that skull with the tentacles. Sooooo cool. Love the second one too. If I didn't have enough to color, I'd totally snap it up. 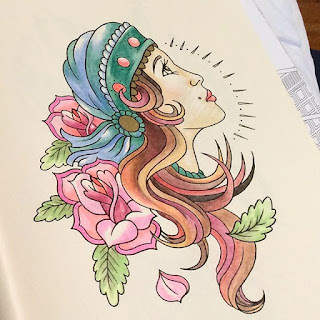 Agreed that we need an Andi's coloring techniques post! My Star Wars coloring book also has terrible, disintegrating paper, but considering I grabbed it on a whim at the dollar store, I'm not complaining. I got some cardstock paper and scan and print on that when I love the image but don't love the paper quality. Bonus to that approach is when I get partway through and hate a choice I made I can print another and start over. Paper quality is sooooo important. I've mostly colored with markers so far (though you are really making me rethink that strategy), so a thick paper is super important, particularly if there's any large spaces to color in. Thin paper gets all sodden from marker ink then. This is one of the things I love about Johanna Basford's books -- her paper is always nice and thick. I was trying to come up with a pithy comment about the coloring book in general, and then it struck me. We are now reviewing coloring books. Coloring books. This strikes me as absolutely hilarious and just more proof that we truly never grow up, do we? Hope you are feeling better and your summer cold is a short one. Walked into my local B&N the other day and the entryway was filled with adult coloring books. 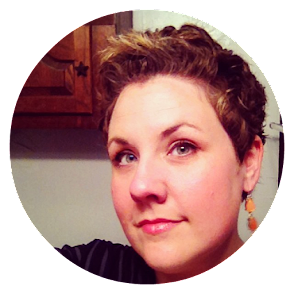 This one was there and just on first impressions, it looked like the one I'd most likely choose. I have been wanting to try a coloring book ever since I saw yours on instagram! I love that you wrote this review. I just read a piece on the new trend (and benefits) of adult coloring books. I'm eager to order one and try the new fad out!